Spectre is the 24th film in the James Bond series and today, a new IMAX poster has been released. It features James Bond 007 himself, centred on the film’s dramatic opening scene which takes place in Mexico City during the hauntingly beautiful “Dia de los Muertes” celebrations – the “Day of the Dead” holiday. 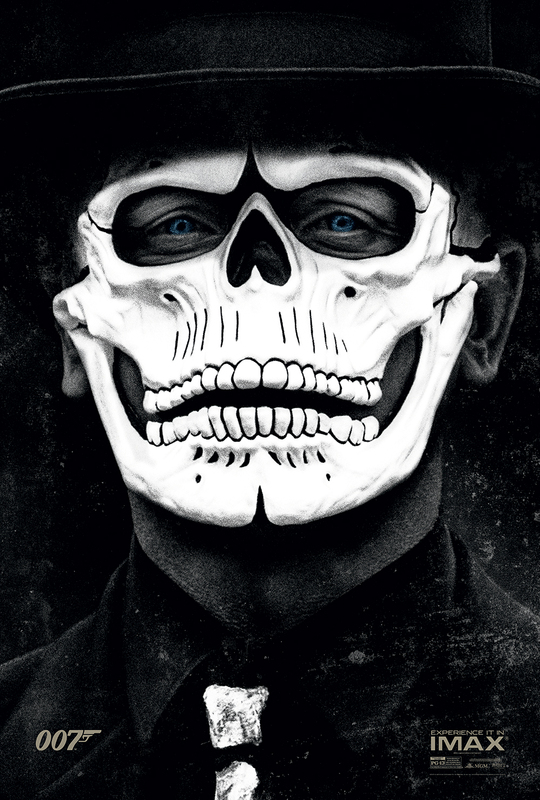 Bond is decked out in a customary skull mask radiating the mystery that 007 fans know and love. The plot revolves around a cryptic message from Bond’s past which sends him on a trail to uncover a sinister organization. While M battles political forces to keep the secret service alive, Bond peels back the layers of deceit to reveal the terrible truth behind SPECTRE. Daniel Craig portrays 007 for the fourth time and Sam Mendes will again direct, following his first entry in the series with 2012’s Skyfall. Ralph Fiennes returns as M, as does Naomie Harris as the new Miss Moneypenny, aka Eve, and it’s a sort-of twist like that in Skyfall which makes you realise that while newbie Christoph Waltz is Franz Oberhauser, you just know he’d make a great baddie, and with the title of the film being “Spectre“, you just know he’s going to be Ernst Stavro Blofeld! Meanwhile, Ben Whishaw returns as Q, with Rory Kinnear as Tanner, while other newbies are Guardians of the Galaxy‘s Dave Bautista as Mr. Hinx, plus Bond girls Monica Bellucci as Lucia Sciarra, and Blue is the Warmest Colour‘s Léa Seydoux as Madeleine Swann. And seeing Jesper Christensen as the harsh Mr White, I can only now see him as the hippy, drippy Thomas in The Legacy. The cast is rounded off with Sherlock‘s Andrew Scott as Denbigh. The IMAX release of Spectre will be digitally re-mastered into the image and sound quality of The IMAX Experience with proprietary IMAX DMR (Digital Re-mastering) technology. The crystal-clear images, coupled with IMAX’s customised theatre geometry and powerful digital audio, create a unique environment that will make audiences feel as if they are in the movie. You can find out more info about this on the IMAX website. Spectre was due to be released in UK cinemas on October 23rd 2015 but that has seemingly been pushed BACK to the 26th, which is a Monday! The US release is on November 6th. I just hope it’s better than Skyfall. I loved Casino Royale, and it’s widely accepted that Quantum of Solace was pretty average, but Skyfall was way overblown by the critics who clearly said they loved it whether they did or didn’t. Me? I thought it was worse than Quantum, and you can find out why in my review here.